The GS 350h Limited announces its presence with an hourglass grille stretching from bonnet to asphalt, painted alloy wheels, wide fenders and dark taillights. Overseas model shown. Standard 18-inch aluminium wheels with a multi-spoke design confidently grip the asphalt of your favorite roads. Easily within eye view, a 12.3-inch infotainment screen with full-screen map capabilities is equipped with the Lexus Navigation System. Arranged in a distinctive L-shaped Lexus design, LED taillights emphasise a sharp look that identifies your vehicle as a Lexus even at night. Inspired from jewelled clocks, this analog timepiece provides elegant styling yet is GPS-based, so it never needs to be manually set or adjusted. Reach your destination effortlessly. 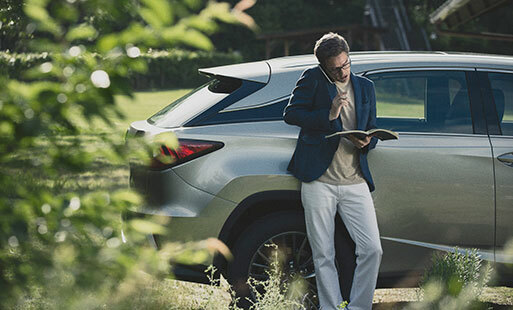 The Lexus Navigation System is equipped with route tracing functions, and displays estimated arrival time. Overseas model shown. The GS 350 Limited is powered by a robust 3.5-litre V6 engine providing 232 kW power and 380 Nm of torque. Aero underbody construction and stabilising fins are integrated into the undercarriage for complete aerodynamics and a low drag coefficient. Overseas model shown. Expect effortless acceleration and almost imperceptible gear shifts with the eight-speed automatic transmission. Overseas model shown. The All-speed Dynamic Radar Cruise Control helps your Lexus maintain a safe distance from the vehicle in front of you. When you drift into another lane without a turn signal, the LDA system alerts you on the multi-information display. The steering assist will can help steer you back into the correct lane. The parking assist monitor accurately guides your parking attempts by superimposing projected parking lines on the rear camera’s video feed. The PCS is a collection of intelligent warning sensors at the front of the car that alert you and help to avoid potential accidents. Be the first to get the latest updates and promotions on the GS 350 Limited.